2 Not rideable on ARK: Mobile. 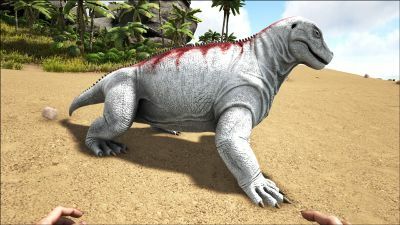 The Moschops (Mose-shops) is one of the creatures in ARK: Survival Evolved. Moschops Cibumutante in the wild is a lazy, cowardly creature that typically lives in the Island's forests, primarily making its home among the great redwoods of the western regions. It survives by being extremely flexible in its eating habits and completely averse to fighting. It never starves, since it can eat just about anything. It runs at the slightest provocation but is still often preyed upon. What makes Moschops particularly interesting is what it can be trained to do with its eating habits. With a versatile palate and tough teeth, Moschops can be tamed for a unique ability: over time it can be accurately taught exactly which things to gnaw, increasing the likelihood of harvesting the specific resource its master desires. For example, teach it to prioritize chewing Prime Meat, and Prime Meat will be easier to harvest from the flesh it consumes. Likewise for rare plants materials, and so forth! Just don't expect Moschops to protect you, though! Even after taming, it will quickly flee when enemies are nearby. Regardless of being fed well, increasing its strength, or how much affection, you shower on it, Moschops retains its inherent cowardly nature! Its lack of combat might deter the use of this companion but the ability to ride Moschops while making use of its diverse harvesting is a rare treat. 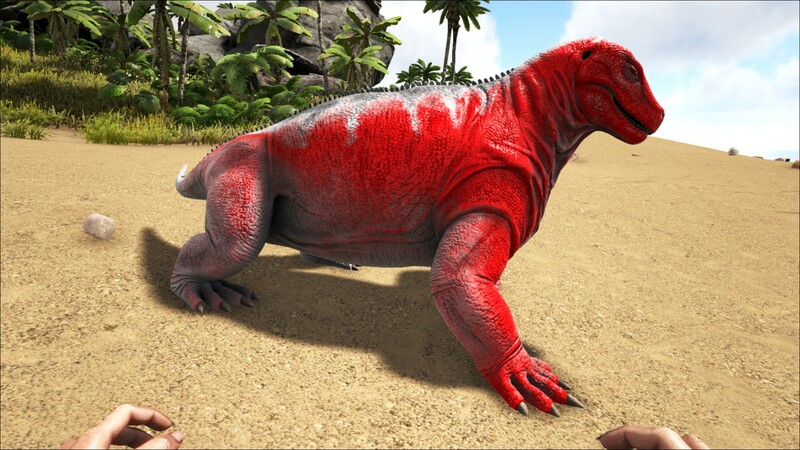 The Moschops is a passive, friendly animal that doesn't take notice of survivors or other creatures, until attacked. When threatened, they will flee. A lone Moschops may flee even if its egg is stolen, although groups may attack instead. Despite its appearance, the Moschops is not a dinosaur or even a relative, but much more closely related to mammals as it is a Therapsid, or mammal-like ancestor. It has a barrel-shaped body to hold the large gut necessary for its varied diet with sprawled-out forelimbs and a short tail. Perched on its body is a short, thick neck with a broad head. This section displays the Moschops's natural colors and regions. For demonstration, the regions below are colored red over an albino Moschops. The colored squares shown underneath each region's description are the colors that the Moschops will randomly spawn with to provide an overall range of its natural color scheme. Hover your cursor over a color to display its name and ID. For example, "cheat SetTargetDinoColor 0 6" would color the Moschops's "body" magenta. When passive taming a Moschops, it will randomly cycle through one of the following foods it wants to eat. Feed it exactly what it asks for. Since it is a passive tame, you should not knock it out, if you do its hunger will decrease rapidly making any future passive taming attempts useless. Build a pen with 4 fence foundations and 4 fences. You can safely passive tame it now without having to worry about letting it walk away. Remember to stock up on all the resources it eats before attempting to tame one, as it will cycle through food it wants. Because many of these resources can spoil, it is advised to take a dino along to store them until needed. This section describes how to fight against the Moschops. The Moschops will flee when attacked. It is a myth that stealing their eggs will provoke them. They will simply run away. They will attack ONLY if you take too long killing them, though their damage is rather negligible. Attacking from afar with ranged weapons or driving them into a corner where they can easily be finished off. Because of their low HP, you can also throw bola at Moschops and hit it with a Spear or Pike a few times. Ranged weapons or powerful mounts that can kill the Moschops in one swipe are recommended, as Moschops are fast runners but you can still easily outrun them when sprinting. Alternatively you could use a fast mount to hound them or shoot from, such as a Raptor or a Parasaur. The Moschops itself poses little threat. But the biggest danger of Moschops is chasing them and encountering more aggressive animals. Beware as when cornered they might occasionally attack you, usually taking players off guard with their huge damage for a "passive" creature. Moschops' reluctance to fight is its biggest weakness and it often falls prey to large and fast carnivores. The Moschops will always flee whenever another creature attacks. On aggressive, it will continuously flee from nearby "threats", even those that don't attack (e.g. passive/skittish creatures). On neutral, it will flee when directly attacked (not just when combat begins nearby). If you whistle to attack a specific target, it will flee from that target instead. If ridden they now CAN do a substantial amount of damage to an enemy dino. Gathers bushes and trees autonomously while Wander Enabled (berries, seeds, thatch, wood, etc.). Like Gigantopithecus, it can gather fiber from bushes. This can provide good quantities of fiber for players without a Gigantopithecus or a sickle to harvest for themselves. In addition to bonus stats, each time you spend a skill point you will also gain the ability to apply "Harvesting Levels" via the tame's wheel menu (see gallery below). Recommended to level in weight for storage capacity. Each point invested will increase both the likelihood of gathering a particular resource (relative to other drops, "weight") and the quantity of the resource gathered (e.g. 200% is twice the base yield). It is currently unknown if the bonus from Harvesting Levels stacks additively or multiplicativly with Melee Damage. Leech Blood Harvest Leeches, Deathworms or Lampreys. Organic Polymer Harvest Kairuku, Mantis, Hesperornis or Karkinos. One smart strategy for farming polymer is raising and breeding penguins for polymer. You can harvest polymer effectively and in the safety of your own base. Take note that adult tamed penguins drop more polymer than baby tamed penguins. Rare Flower The Island: Wander enabled near the appropriate bushes in the Swamp, Snow Biome or mountainous regions. Scorched Earth: Wander enabled near the purple/white flowers on Scorched Earth. Aberration: Wander enabled near red-stemmed red mushroom/blue-stemmed cyan mushroom. Rare Mushroom The Island: Wander enabled near trees within the Swamp. Scorched Earth: Wander enabled near the appropriate bush nodes. Aberration: Wander enabled near red/cyan mushroom. Raw Prime Meat Harvest appropriate corpses. Can harvest corpses under the Prime effect of the Ichthyornis. Raw Prime Fish Meat Although Moschops can level up prime fish harvesting they are unable to collect meat at all from fish (Coelacanth, Sabertooth Salmon, Piranha). However they might be able to collect prime from ocean sources. Sap Scorched Earth only: Wander enabled near to Joshua Trees. Raw Mutton Although sometimes stated the harvest level of prime meat does not affect the collection of raw mutton - still Moschops do suprisingly well in harvesting it. Utilizing Karkinos allow easy guidance to them harvesting resources when put to wander while grabbed and close to said resources/corpses. The real-life counterpart was likely a herbivore and probably would not have eaten meat. TLC Pass 2 accidentally allowed players to ride on Moschops, but it was removed. Afterwards, it has been announced that them being rideable were intentional due to player's feedback and staff discussion, and was subsequently released 4 days after the announcement. This unfortunately comes with a hidden nerf that greatly reduce the amount of resource it can harvest. It is possible to knock out a Moschops, although it can't be tamed if one is knocked out. ↑ Rideable Moschops, Sponsored MOD program updates & more!